Jeffrey Gonyeau’s job title sounds like it belongs to an elderly bearded character who lives in a world where time is fickle, a place ripped from the deepest nooks of J.K. Rowling’s imagination. For more than a decade, Gonyeau has been the unofficial Keeper of the Clock, a task bestowed on him following years of grass-roots work with city officials and community organizers to restore and resurrect the ornate tower clock that sits prominently in Ashmont’s Peabody Square. Gonyeau’s journey to becoming “keeper” began almost 20 years ago, when he moved to the Ashmont area from Cambridge. He was enticed by the sense of community there, he said. And he was immediately drawn to the clock. As a history buff with a background in preservation, he was fascinated by the details of the gargoyle-like dog heads that grace its four sides, and the leafy ornamental trim that races up the corners of its blocky top. He also liked the way the roughly 15-foot-tall clock commanded the neighborhood’s attention, pulling together the firehouse, the Peabody Square apartments, and All Saints Church, all vestiges of the late 19th century. The mechanical clock sits on the corner of Dorchester Avenue and Ashmont Street, with its original, prickly-looking pineapple finial, a symbol of welcome. The clock, specially designed by an architect, was manufactured by the E. Howard Company, the predominant clock maker of its era. It was erected in 1910. In the mid-1970s, according to the Dorchester Historical Society, the city’s parks department, which was responsible for the clock’s maintenance, removed some of its innards and installed an electric motor to drive the gears. By the time Gonyeau had moved to the area in 1997, the clock had stopped, left to endure New England’s scorching summers and frigid winters without ever telling passersby the hour of day. Parts of the top, which holds the four clock faces, had rotted. The electric motor that made it tick was dead. Gonyeau set to work. In 1999, he marshaled neighbors to advocate for its restoration. With the support of the late mayor Thomas M. Menino’s administration, the clock was dismantled and shipped to the Balzer Family Clock Works company in Maine, where it underwent extensive repairs. In 2003, it was rededicated to much fanfare, and Gonyeau was given a key — and a title. The large stack of documents she keeps about the Peabody Square monument serves as a reminder of what needed to be done. But most of all, she remembers Gonyeau’s demeanor and drive to help revitalize a city landmark. These days, Gonyeau keeps his focus on the clock’s general upkeep. He arrives every Sunday, key in hand, following church services across the street, and walks up to the thigh-high black fence that wraps around the clock. He slips through the gate’s opening, steps up onto the granite plinth that the clock stands on, and slides the key into the lock of a metal access panel. Teetering on the edge of the plinth, he opens the panel and peers inside. The soft “tick-tock-tick-tock” of the moving parts is drowned out by roaring traffic and honking horns. Gonyeau picks up the small hand crank that rests on a shelf inside, and connects it to the clock mechanism. He gives it several hard turns, lifting the 132-pound counterweight that regulates the pendulum. The noise sounds like a taut fishing line being reeled in. If the time needs adjusting, Gonyeau fiddles with a notched dial that moves the clock’s wooden hands high above. Some days, he reaches down and picks up a small oil can hidden inside the pillar, and spritzes the gears, dabbing the excess oil with a cotton swab. His work is over in a matter of seconds, but it will keep the clock running for the week. If he forgets to come back the following Sunday — even if he’s a little late — he knows he’ll likely hear about it. Not long after uttering those words, as Gonyeau stood beside the landmark, a shout came from a man across the street in a pickup truck bearing the Ashmont Grill logo. 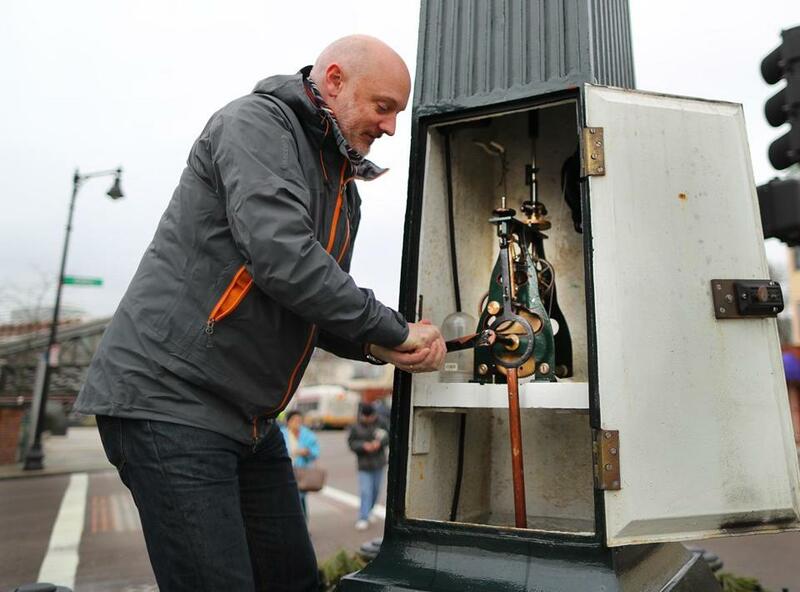 Jeffrey Gonyeau is the unofficial “Keeper of the Clock” for the public clock in Dorchester’s Peabody Square.